Hi everyone, are you all loving the limited edition items in the Snowflake Showcase? I am! They have such versatility as they aren’t just for Christmas. The designers at Stampin’ Up! have shared some gorgeous samples an I really wanted to share them with you. 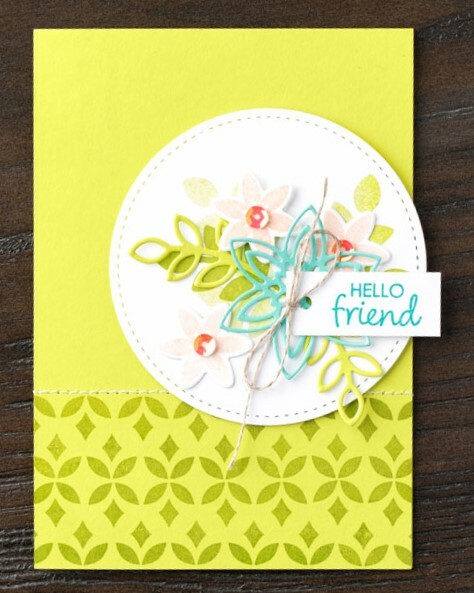 The first card uses the Happiness Surrounds stamp set along with the Snowfall Thinlits dies. Don’t forget the items in the Snowflake Showcase are only available until the end of the month (or while stocks last)! Isn’t this a gorgeous showcase? I cannot wait to start creating with this line. It has such potential! For the month of October, please use the code above if your order is less than $250 to receive a little gift from me. If your order is over $250, do not use this code as you will be entitled to Hostess Benefits on your own order.